The move file operation, move a file from one folder or sub folder in the application sandbox, to another folder or subfolder in the application sandbox, and vice versa. In today’s workshop, you will implement four new features in the NiftyTextFile project. 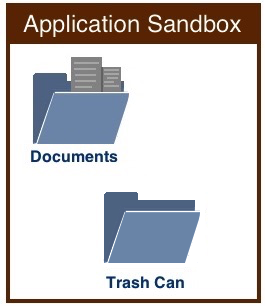 You will create a subfolder called Trash Can in the sandbox’s Documents folder. 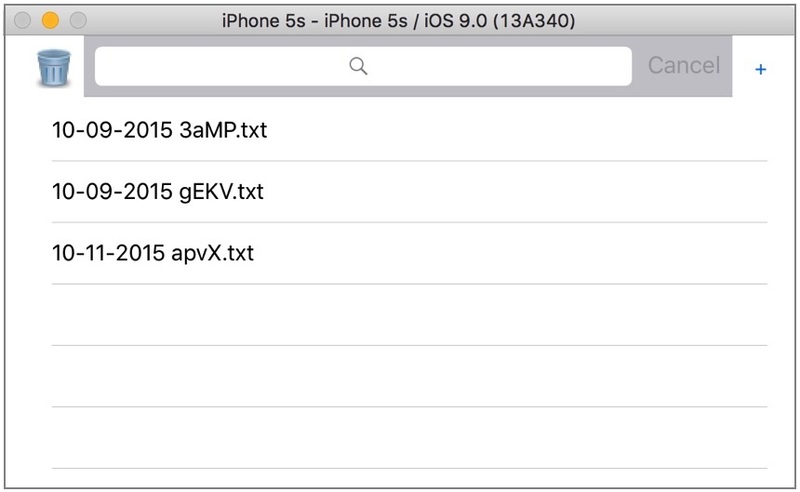 It will hold text files the app user delete from the Documents folder and the File List’s table view cells. When the app user swipe a table view cell and tap the red Delete button, the app will move the swiped cell’s text file out of the Documents folder and put it in the Trash Can subfolder. 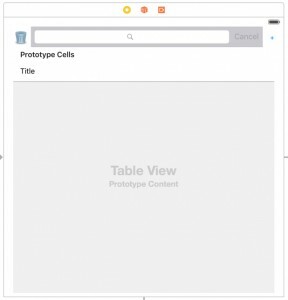 In addition to this, the app will remove the text text file from the table view’s dataSource, and delete the swiped table view cell. The diagram below shows the move text file operation. The QuickTime movie shows the move text file operation in action. 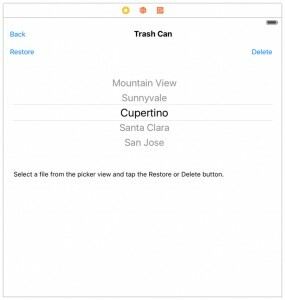 When the app user select a text file from the Trash Can’s pickerView and tap the Restore button, the app will move the text file from the Trash Can subfolder, and put it back in the Documents folder. The app will refresh the pickerView; so the deleted text file no longer appear in its component. The app will also display a message in the textView. The diagram below shows the move text file operation. The QuickTime movie shows the move text file operation in action. 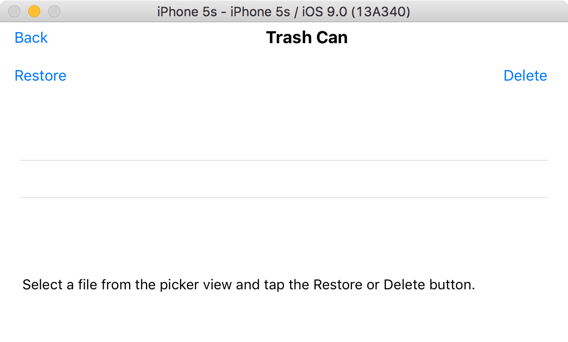 When the app user select a text from the Trash Can’s pickerView and tap the Delete button, the app will permanently delete it from the Trash Can subfolder. The app will refresh the pickerView; so the deleted text file no longer appear in its component. The app will also display a message in the textView. 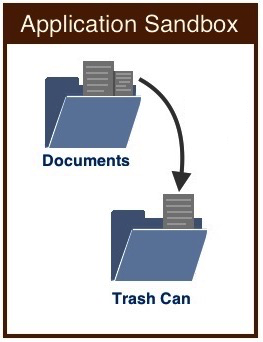 The diagram below shows the delete file operation. The QuickTime movie shows the delete text file operation in action. You will add a feature in the NiftyTextFile project that change a trash can button’s image property programmatically. If a trash can subfolder is empty; an empty trash can image should appear on the trash can button; otherwise, a full trash can image should appear on the trash can button. The diagram below shows the image swapping feature you will implement in the NiftyTextFile project. The QuickTime movie shows the image swapping in action. As of now, the Trash Can subfolder doesn’t exists in the NiftyTextFile’s Documents folder. So before you implement the move text file operations and the delete text file operation in the project, you have to enter this function in the TextFileManger class file. It create a subfolder in the Documents folder. The name of the subfolder the function will create is passed as a parameter. 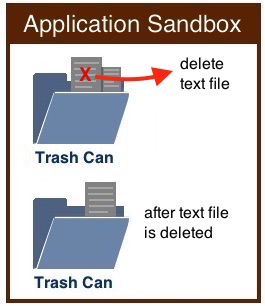 Now, here’s the code to create a subfolder called Trash Can, in the sandbox’s Documents folder. Put the code in the AppDelegate.swift file. 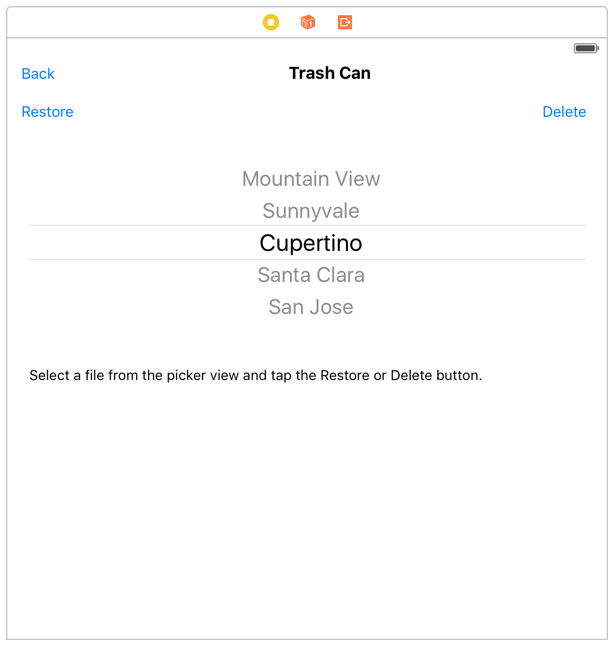 Now, since the app user will perform two move file operations and a delete file operation, you’ll have to modify the File List View Controller scene by adding a Button object on the left side of the Search Bar, clear out its Title attribute, and set its Image attribute to display an empty trash can image. You’ll have to download an empty and full trash can icon from iconfinder.com and add them in the project’s Assets folder. Next, drag a View Controller from the Object Library and drop it on the right side of the initial scene. Configure the new scene by adding three Buttons objects and set their Title attributes to display: Back, Restore, and Delete. Next, add a Picker View and a Text View on the scene’s canvas. Set the Text View’s Text attribute to display text shown in the image below. Also, remove the check mark from the textView’s “User Interaction Enabled” attribute. Set the Text View’s width to 566 and its height to 260. Next, set the Picker View’s width to 560 and its height to 216. 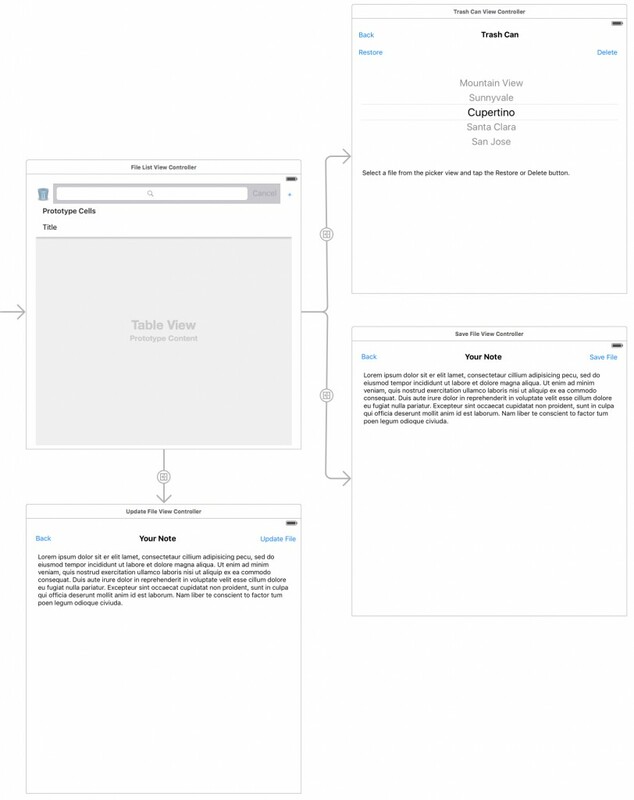 Next, connect the Picker View’s dataSource and delegate outlet in Interface Builder. Now, add missing constraints to the scenes object and connect the Back button to the scene’s Exit object. When prompted, select the unwindToMainView Action Segue. You have to add a Cocoa Touch class in the project and configure the options window to look like the image shown below. In the Identity inspector, connect the new scene to the TrashCanViewController class. Now, create segue that connect the File List View Controller scene’s trash can button to the Trash Can View Controller scene. When prompted, select show from the Action Segue menu. Now is a good time to build and run the app on your real device or the Simulator. The File List View should look like the first image shown below. When you tap/click the trash can button, the app will display the Trash Can View. The second image below shows what it should look like. What you have to do now is read the Trash Can subfolder and dump the results in the pickerView’s dataSource; which is an array called fileList. Start by entering this function in the TextFileManager class. Next, enter this statement in the TrashCanViewController.swift file’s viewDidLoad() function. Read the Trash Can subfolder and dump the results in the pickerView’s dataSource; which is an array called fileList. Populate the pickerView’s component rows with text file names that are in the fileList array. 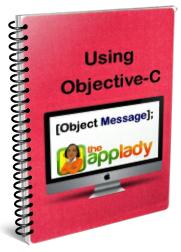 Display the selected text file’s name in the textView. Since the Trash Can subfolder is currently empty, nothing is shown in the pickerView’s component rows. Finally, you are ready to implement two move text file operations and a Delete text file operation in the NiftyTextFile project. The first move text file operation will happen when the app user tap the red Delete button on the File List’s table view cell. The second move text file operation will occur when the app user tap the Restore button that’s on the Trash Can view. The delete text file operation will happen when the app user tap the Delete button on the Trash Can view. With that said, here’s the functions to implement both move text file operations and the delete text file operation. Put them in the TextFileManager class. Now, here’s the code to enter in the FileListViewController.swift file’s commitEditingStyle() function. 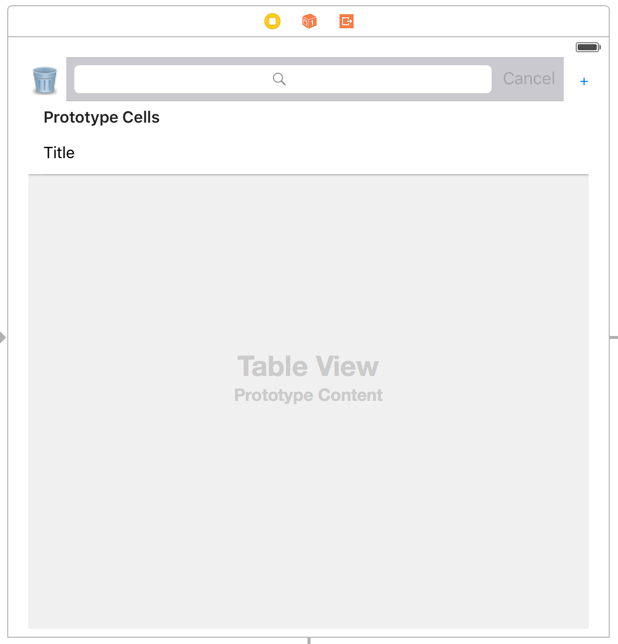 As you already know, code in that function is fired when the user tap the red Delete button in a swiped table view cell. To see output the code produce, watch the first QuickTime movie presented above. Here’s the code to put in the TrashCanViewController.swift file’s restoreButtonPressed() function, the deleteButtonPressed() function, and output they will produce. To see output the code produce, watch the second and third QuickTime movie presented above. 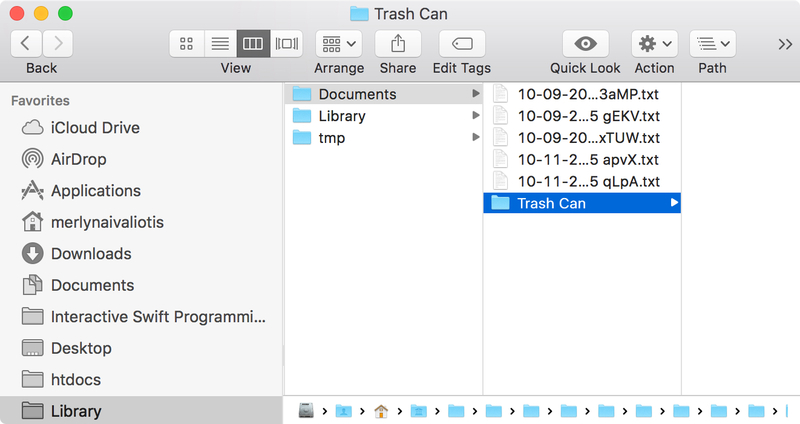 textView.text = "Pick a file first"
See that empty trash can image on the File List’s button. Let’s change its image property programmatically, based on the number of files there are in the Trash Can subfolder. 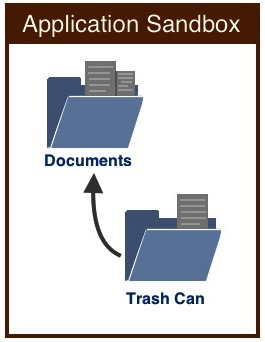 If the subfolder is empty; an empty trash can image should appear on the trash can button; otherwise, a full trash can image should appear on the trash can button. To implement this image swapping feature in the FileListViewController class; you have to enter code in two functions. Start by putting this code, below existing code in the FileListViewController.swift file’s viewDidAppear() function. 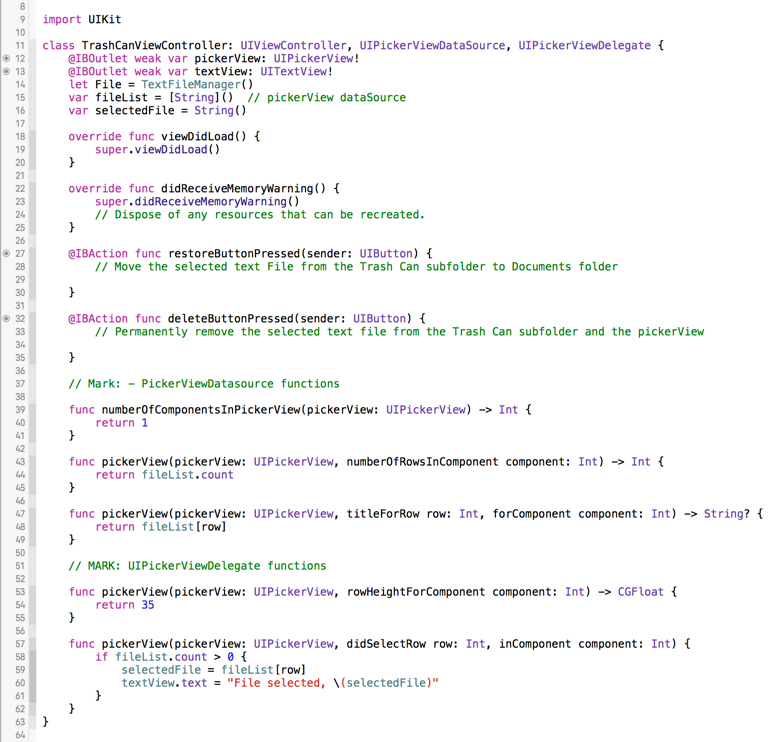 Next, put this code, below existing code in the FileListViewController.swift file’s commitEditingStyle() function. To see output above code produce, watch the fourth QuickTime movie presented above.